"And the people stood by by, watching"
This is a poignant statement made by Luke in his gospel as to what the people of Jesus' time did as they followed him to Calvary and then to his crucifixion. We spent our Good Friday at a parish that once served the Irish immigrants and now serves the Hispanic and Asian communities that have come into this country. 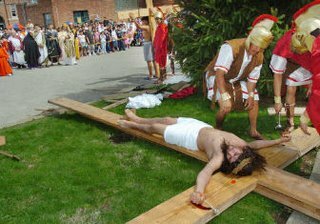 A somber yet festive recreation of the Passion of Jesus with the Stations of the Cross that led us out of the compound of the parish and into the streets of one of the more crime heavy areas of the city. A slow moving procession of about three hundred souls chanting: "Lord have mercy on your people! "as Jesus carrying his cross went through the streets being beaten by Roman soldiers as though he were a beast carrying a load for them--of course he was carrying the load of our sins on that cross! Along the way the people of the neighborhood gathered at their doors--people of all types, some scantily clad (it was close to 80 degrees--summer like here), some on cell phones :"and they watched"--and of course I too "watched"--they the recreation of the passion in their streets, me the ongoing passion that no doubt is being lived in their lives. God save us all, we who watch as your Son is crucified. We who stand by as He passes through our streets, offering us mercy that we dare not rise up to receive. We who receive that mercy and do not reach out to share it with those in need.